Imbued with these snapshots of past and present, Didit Hediprasetyo’s 2014-2015 Fall-Winter Couture Collection nonetheless yields to no retro temptations. There’s nothing vintage: everything is of the here and now, fired by the mood of the moment. 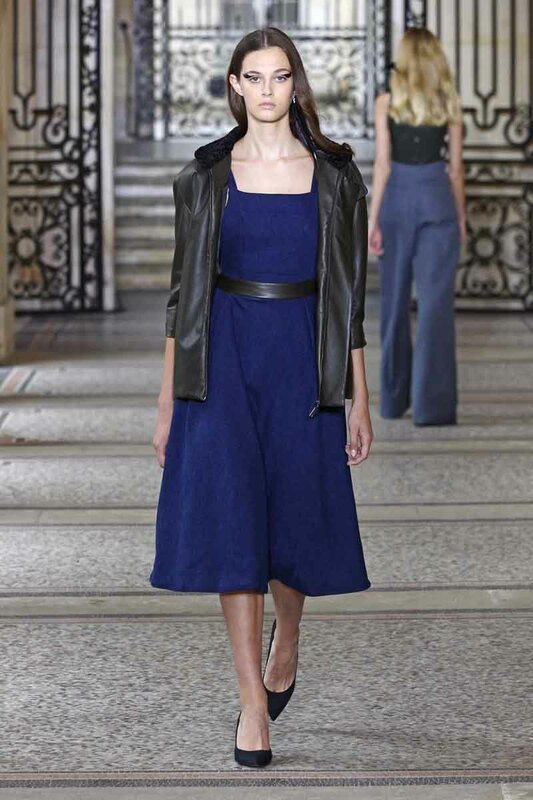 A leather bomber jacket worn over a dress with a train; revisited denim dungarees worn close to the skin. Oversize shoulders and a loose hang mingle with the straight cuts of second-skin dresses. Scarf tips that sweep the asphalt and silk jersey drapes that reveal flesh at every step outrage modesty and glorify the body in movement. Variations on the jacket, that modern form of power dressing: a Boyfriend denim jacket with khaki lambskin lapels gives the cue to a topstitched denim spencer with ribbing on the front and a lambskin bolero with reversed volumes on the back. Like the plumbline of the silhouette, it slips on over a top with the rounded lines of a bodysuit and irresistible high-waisted trousers in chambray. “Jolie madame” denim dresses have strapless tops placed directly on tulle. Leather braiding gives a muscular, radical touch to the look. Herringbone in songket, that traditional Indonesian brocade, gives rhythm to the volume of a jacket with a fox fur collar. The skilled work of the Lesage workshop distils its poetry and expertise in embroideries: birds flitting over the length of a skirt, a sparrow delineated in thread on a tube dress in army green polo knit, or outlining the stars scattered over a denim dress. The day and evening wardrobe of this Didit Hediprasetyo girl is vibrant with the contrasts of urban denim, the romantic and decorative, the richness of songket and tailoring straight from the Forties. A personal style that belongs to her alone.